Newcombe filed suit on March 10, 1994, against Coors, the advertising agency that created the ad, and Time, Inc., publisher of Sports Illustrated. He alleged that his identity had been misappropriated in violation of California statutory and common law, that the advertisement was defamatory because it portrayed him — a recovered alcoholic — as endorsing beer, that the advertisement was negligently created, and that the defendants intentionally inflicted emotional distress upon him. He sought to prevent the advertisement from future publication and asked for $100,000,000 in damages. Judge Stephen Wilson of the United States District Court for the Central District of California dismissed Newcombe’s case in 1995, holding that Newcombe could not prove any of the claims he made. Undeterred, Newcombe appealed to the 9th Circuit. The court eventually found there was a genuine issue of material fact as to whether the defendants made use of Newcombe’s likeness and reversed district court’s grant of summary judgment in favor of the defendants on the common law misappropriation and Cal. Civ. Code § 3344 claims. The reviewing court held that Newcombe was not able prove his claims of defamation, negligence, and intentional infliction of emotional distress, so the district court’s granting of summary judgment as to those counts was affirmed. The case was returned to Judge Wilson for further handling. On October 21, 1998, the parties agreed to dismiss the district court case with prejudice — most likely because defendants agreed to pay Newcombe some measure of damages (it does not appear that the amount of any possible settlement was reported in the newspapers of the time). Perhaps even more amazing in this whole story is that the Killian’s advertisement was probably not the first time Newcombe’s likeness was used for an illustration! You be the judge as to whether the Washington Senators actually incorporated Don Newcombe as part of their primary logo from 1961 through 1971! • Newcombe v. Adolf Coors, Co., 157 F.3d 686 (9th Cir., 1998). • Dan Stoneking, “Highballs Put Don Newcombe’s Fastball and Career on the Rocks,” Minneapolis Star, February 26, 1981, 42. • “Judge Dismisses ‘Newk’s’ Suit Over Beer Ad,” Indiana (Pennsylvania) Gazette, September 8, 2001, 27. • “Court Clears Way for Newcombe to Sue,” The Record (Hackensack, New Jersey), September 23, 1998, 16. • Civil Docket for Case #: 2:94-cv-02282-SVW-BQR, CDCA, Western Div. 1961/Primary_Logo, last visited February 25, 2019. • https://i.redd.it/3r1yzt8l7sh21.jpg, last visited February 25, 2019. 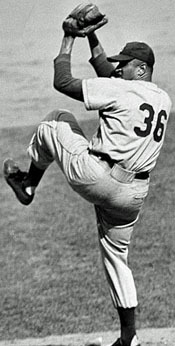 We hoped you liked reading Don Newcombe and His Likeness: You Be the Judge by John Racanelli! JOHN RACANELLI is a Chicago lawyer with an insatiable interest in baseball-related litigation. When not rooting for his beloved Cubs (or working), he is probably reading a baseball book or blog, planning his next baseball trip, or enjoying downtime with his wife and family. He is probably the world’s foremost photographer of triple peanuts found at ballgames and likes to think he has one of the most complete collections of vintage handheld electronic baseball games known to exist. John is a member of the Emil Rothe (Chicago) Chapter. Check out his corner of the internet at Baseball Law Reporter. So, you must know Sheryl, right?